232 pages | 4 B/W Illus. Exploring international and intercultural perspectives, Making an Impact on School Bullying presents a much-needed insight into the serious problem of bullying in schools. As the effect of bullying on victims can be devastating, and bystanders and even perpetrators are often also negatively affected by the experience, finding successful solutions to the problem of bullying is crucial for improving school life around the world. This invaluable book looks at a range of practical interventions that have addressed the problem of school bullying. Peter Smith presents a curated collection of seven examples of successful anti-bullying procedures from around the world - including the US, Europe and Asia - and an exploration of cyberbullying. Each chapter examines the context in which the interventions took place, how theoretical knowledge transferred into practice, and the impact and legacy of the work. 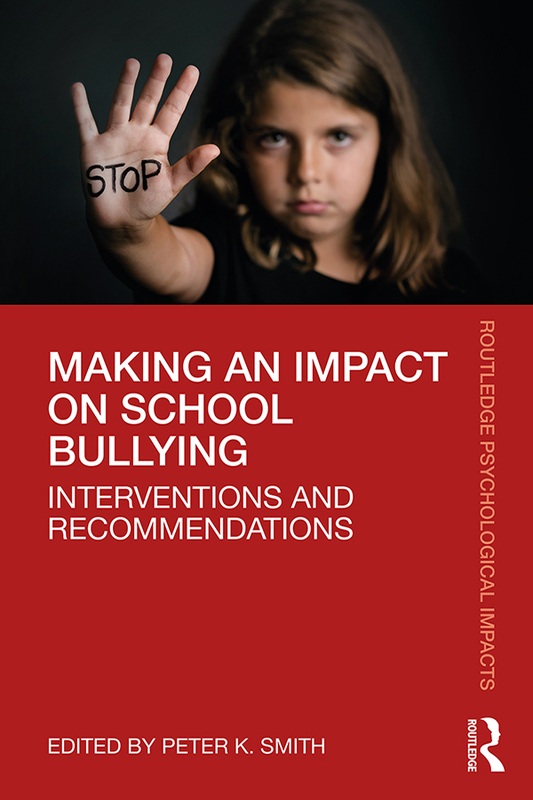 Covering the most important and widely-used strategies to combat bullying, the book provides readers with a roadmap to developing practical and impactful interventions. Ideal reading for students and researchers of education and developmental psychology, Making an Impact on School Bullying is also useful for school counsellors and education authorities. "Making an Impact on School Bullying brings together in one volume an overview of a wide range of international programmes to address bullying in schools, written by leading researchers and programme designers from across the world. Each chapter provides a research-informed summary of the intervention and its impact, allowing the reader to gain valuable insights into successes to date and the remaining challenges for researchers and practitioners. An invaluable and timely collection!" - Dr Noel Purdy, Director of Research & Scholarship, Stranmillis University College, Belfast, Northern Ireland (UK). "This thorough but easily attainable overview of some of the most well-known and successful bullying interventions provides a comprehensive and updated knowledgebase. Apart from describing the different methods success it also focuses on the challenges encountered and the lessons learnt. This is an unusual but extremely helpful approach that enhances the readers' understanding of the field. This book is the ideal reading for anyone interested in the field of bullying interventions and it makes an important stepping stone for the next generation of anti-bullying work." - Ann Frisén, Professor, Department of Psychology, University of Gothenburg, Sweden. 5. Anti-Bullying Programs in the United States: What Works and What Doesn’t? Peter K. Smith is Emeritus Professor of Psychology at the Unit for School and Family Studies, Goldsmiths, University of London, UK. In 2015 he was awarded the William Thierry Preyer Award for Excellence in Research on Human Development from the European Association of Developmental Psychology.